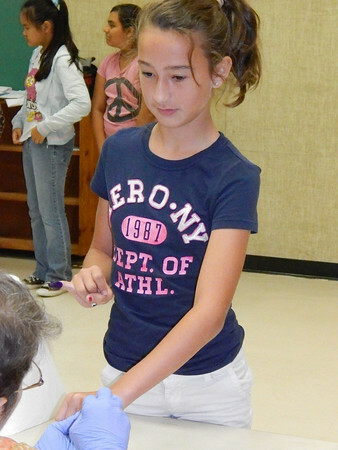 Rotary Club of Live Oak painted Suwannee Intermediate School student's pinkies purple on Thursday, May 15 to help eradicate polio. Millions and millions of children in endemic countries know that a freshly painted purple pinkie means freedom from Polio. When local children make a $1 contribution to Polio Plus, Rotary Club of Live Oak members mark their pinkies with the same gentian violet used around the world on NID, National Immunization Day. This is their personal symbol of one child free from polio forever.